Does Logix5000 have an equivalent to 500's CDM File? I need to monitor several points but I can't get them on the same screen at once. Also, is there a work-around for the lag time when monitoring a bit in 5000? I am watching a timer ACC but it doesn't show in monitor at every cycle. Logix 5000 has a pretty good trend function. 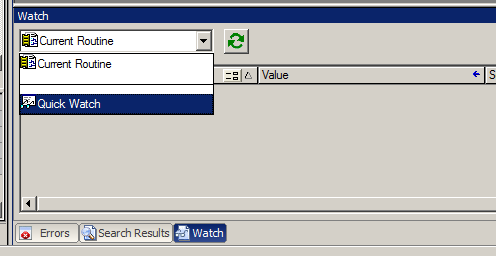 Right-click on "Trends" below data types in the controller organizer and select "New Trend". It's pretty straightforward to set up. 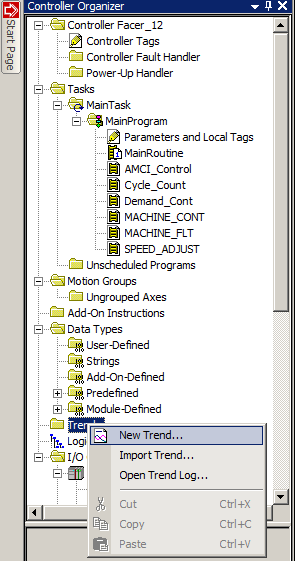 I tried to use Tag Data Monitor but I must have something set up wrong as I get "Error:429, ActiveX Component can't create object"
I don't see the "Quick Watch" anywhere on the screen. Which version of Logix 5000 are you using? 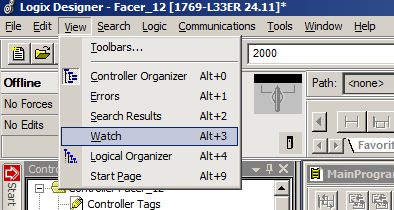 If the watch window isn't in the tab bar at the bottom of the screen by "Errors" and "Search", go to the "View" menu in the menu bar and select "Watch". In the watch window, pull down the combo box at the top that defaults to "Current Routine" and select "Quick Watch". That will let you type in tag names to watch. To find the watch window, go to the View menu and select Watch. In the trend window, right-click and open the trend properties. The Y-Axis tab will set the vertical ranges of the plot, either to preset, automatic, or custom. The Sampling tab lets you set the sample period. I also like to go to the Display tab to change the background color. You can go to the "Window" menu at the top of the software and select to tile, cascade, or whatever so you can see the code and trend windows at the same time. Thanks for the information. I am in your debt. I was able to adjust the settings, in Trends, but the Watch function will be a great help. I can't believe I didn't see it before. I grew up on RSLogix 500 and had to transition to 5000. 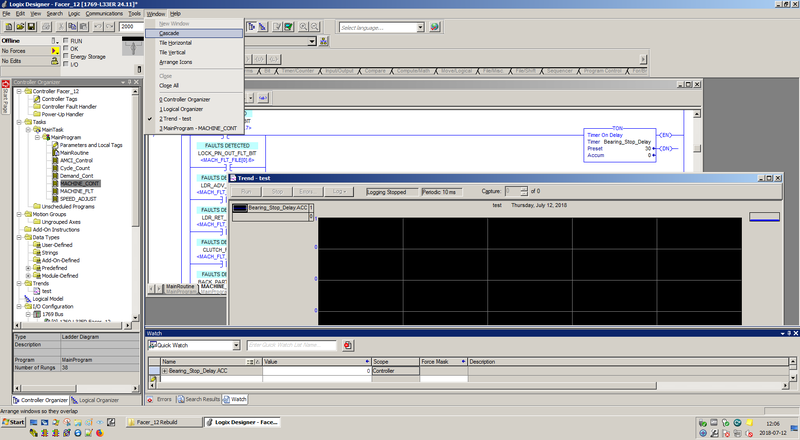 The 2 features of 500 that I miss the most are the inline cross-reference and the CDMs that you can save and open again later.